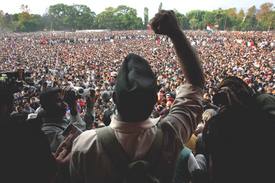 Huge protests planned for April 25, on what would have been day 20 of a nationwide general strike to restore parliamentary democracy, turned into victory rallies after King Gyanendra announced the previous night that the House of Representatives, dissolved in May 2002, would be reinstated. The nearly three weeks of massive protests that brought hundreds of thousands into the streets of cities and small villages were organized by the Seven Party Alliance (SPA) of the country’s main political parties. Across the country, tens of thousands gathered where demonstrations had previously been planned, or held spontaneous celebrations. Madhav Kumar Nepal, head of the Communist Party of Nepal (United Marxist-Leninist), told one gathering in the capital, Kathmandu, that the reinstated Parliament’s first priority would be to announce elections to a constituent assembly and formation of an interim government. Kumer Nepal, whose party holds the second largest number of seats, 68, in the 205-seat House of Representatives, pledged that the new government would correct wrongs committed by past governments, act against those who oppressed the people’s movement, and compensate the injured and the families of those killed during the pro-democracy protests. Through signs and slogans — “Up with democracy,” “Down with autocracy,” and “Hold elections to a constituent assembly” — participants in the celebrations also made it clear they expect the SPA to continue the struggle for democracy. Demonstrators also demanded that the new government punish everyone involved in the repression of the mostly peaceful protests, in which at least 17 were killed and over 6,000 injured, some seriously. The demonstrations during the general strike were the largest since protests in 1990 forced the previous king to accept Nepal’s first democratic elections. The Parliament was slated to meet April 28. The SPA said it remained committed to the agreement it made with the Maoist insurgency last November, which included setting up an interim government and constituent assembly, and urged the Maoists to accept Gyanendra’s proclamation. But the rebel leaders called the SPA’s acceptance of the proclamation “a historic mistake,” and declared that the alliance had “betrayed the feeling” of the Nepalese people. They said their protests would continue until “unconditional elections” to the constituent assembly were announced. The Maoists, who have waged a decade-long armed struggle, reportedly model themselves on Peru’s extremely violent Shining Path. The restoration of Parliament came after the SPA had announced plans to mobilize 2 million people for a showdown on Kathmandu’s Ring Road April 25.